German Machine Tools of America (GMTA), the Ann Arbor, MI-based representative of various lines of German machine tools and metal-fabricating equipment, used FABTECH to show new laser technology from Arnold Ravensburg, a supplier to the German gearmaking, automotive and off-highway powertrain markets. Introductions included a compact laser cell used to weld smaller round components. Available with CO2 or solid-state lasers, this cell is suitable for mass production or smaller batches, owing to the onboard-loading and CNC-programming capabilities of the machine. Workpieces load into the rotary carousel either manually or through robotic automation available from GMTA. The workpiece then is lifted into position, clamped, rotated in the C-axis and laser welded. A new workpiece is loaded during the clamp/weld phase. 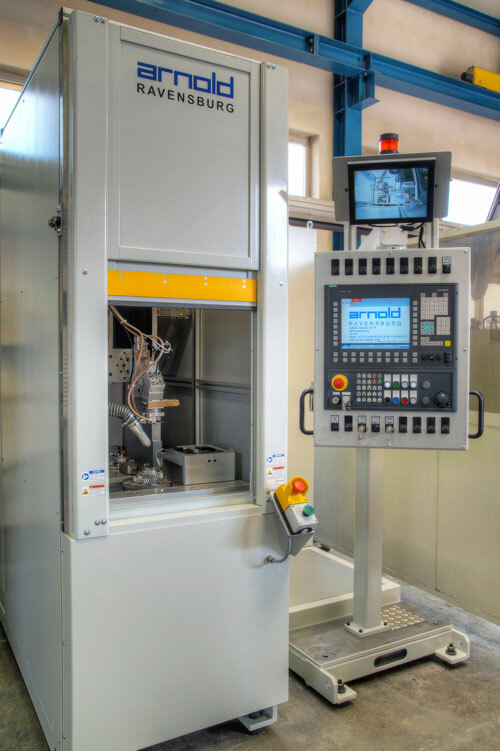 Also offered by GMTA is the Arnold two-station laser cell, used in a similar fashion to the compact cell, but offers a variety of geometries in laser welding, including axial and radial seams, plus an integrated pressing function. The processing optics move on a cantilevered arm to the individual workstations, processing radial or axial seams without changeover of the swiveling optic head. Independent loading-area gates allow simultaneous loading and unloading while the machine operates. Designed as a single-block concept with a common base frame for all system components, all of the machine’s functions are run via CNC.